429, Lot: 238. Closing Sep 26, 2018 at 11:19:20 AM ET. KINGS of CHARACENE. Attambelos IV. AD 54/5-64/5. 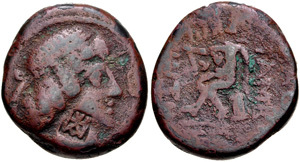 Æ Tetradrachm (24mm, 15.42 g, 12h). Charax-Spasinu mint. Uncertain SE date.